The Club provides VFR Flight Training Tutorials in the following areas. Select any one of the links on the right to go directly to that section, and use any of the "Top" links after each section to return here. The tutorials are tailored to meet the needs of the VFR pilot, whatever his or her level of experience. For further information, please email the Club's Chief Flying Instructor (CFI). What VATSIM is and how it works. How you the pilot interact with other pilots and Air Traffic Control (ATC), carry out instructions, know where you can go and what you can do, without interfering with other members' enjoyment. The source of all this knowledge is VATSIM's own Pilot Resource Centre. Go there before you fly anywhere on line. Getting started with VATSIM requires installation of a special application to connect the pilot to the VATSIM servers via Flight Simulator´s inbuilt multiplayer function. There are two programmes available - "Squawkbox" and "FSInn". Which one to use boils down to personal preference. In surveys carried out by the Club it has been found that broadly 50% of Members use FSInn and 50% Squawkbox. Indeed some use both. The most useful exercise for those with previous experience of flight simulator but new to the Club and VATSIM is to work through our Flying with VATSIM training course. This is a series of ten tutorials prepared by the Cix VFR Club which takes the new pilot from a "sitting, watching and listening" exercise, to flying into a major regional airport, on line and with live Air Traffic Control. The course introduces members to online ATC and enables them to learn at their own pace how to use it. Each lesson consists of a Groundschool section on aviation law and theory, (not heavy, but essential for flying on line), a discussion on flight planning, and a practical exercise to fly using the information in the lesson. The use of voice communications adds a great deal of realism to the Flightsim world. Pilots feel the same pressure to perform properly as do real world pilots. To help members, we have produced a comprehensive manual of Air Traffic Control information for VATSIM pilots. It has been completely revised for 2013 and is much more than just a list of what to say and when to say it (and the replies you can expect from Air Traffic Controllers). It is based on the latest real world practice, adapted for use on VATSIM. Every Club pilot should have his own copy! Version 2.0: Issue date: 01/07/2013 is current. A separate tutorial has been prepared on the Airborne Flight Plan, as it is the most frequently used piece of ATC dialogue, and needs to be learned and well rehearsed. Version 1.3 09/07/2011 is current. A set of "Crib cards" has also been produced which contain the most commonly used ATC phraseology when departing from or arriving at an airport. Print them on card, cut them out and keep them by your PC. Version 1.31 19/08/2012 is current. Real world flight training includes a significant amount of theory learning - "Ground School" as it is called. The CIX VFR Club Flight Training Manual is a comprehensive series of Flight Training tutorials. They are based on the real world UK CAA flight training syllabus, and cover every aspect of learning to fly a light aircraft on Flight Simulator. For anyone starting flying light aircraft in Flight Simulator, perhaps after flying larger aircraft for some time and looking for a new challenge, these documents are essential reading. These two separate subjects are closely linked. To be able to prepare a flight plan, you need to know about visual navigation. To be able to navigate by reference to ground features seen out of the cockpit window, you need to have a flight plan. VFR navigation is covered in Exercises 16 and 17 of the Club Flight Training manual. For Flight Planning, there are a number of tools available which are used by real world pilots, but they mostly cost money. The Club provides its own Flight Planner in the form of a Microsoft Excel spreadsheet. It includes comprehensive instructions. Most useful of all the planning tools for Club members, however is the freeware "Plan-G", a graphical map-based planner with a huge number of options and tools to enable the pilot to plan and carry out almost any flight. Taking all its fixed aeronautical data from Flight Simulator, plus allowing the creation of user waypoints, and then being able to watch the progress of the flight, and, when connected to VATSIM, the flights of other aircraft nearby. Definitely the No.1 tool for Club members. The weather is one of the most important aspects of flying for VFR pilots in small aircraft. VATSIM uses real world weather which is provided in the standard ICAO coded format. 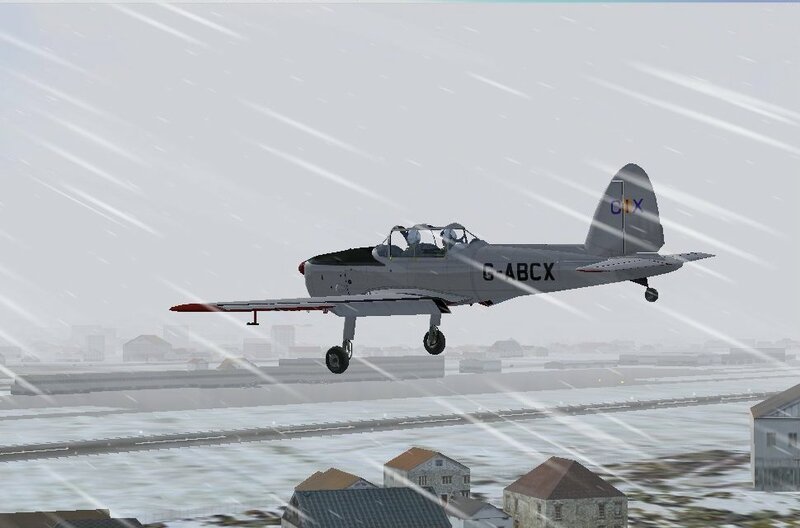 This weather is passed to Flight Simulator as part of the data VATSIM transmits so that all pilots flying in the same area experience the same weather, which adds considerably to the realism of online flying. An excellent tutorial on understanding this coded format is available on the comprehensive Bones Aviation Pages website Metar Decode page, along with much other useful aviation information, including ICAO weather codes explained. The UK Meteorological Office's own weather education website contains a lot of very useful and interesting information about weather for people of all ages. Members can also register (free) with the Met. Office if they wish to obtain access to the real world General Aviation weather information outside the VATSIM environment. New members can request help from the Club's Instructors from simple help to connect to VATSIM, to a complete package to learn how to fly a light aircraft mimicking as realistically as possible, real world flight training. This training is carried out on a one to one basis in shared cockpit mode with FSX, or for FS9, using Teamviewer. It can be a very effective way of getting members flying quickly, or helping them reach an advanced skill level, similar to real world pilots. Club instructors are carefully chosen for their experience, and some hold or have held, real world private pilots licences. The Club runs informal Beginners Nights from time to time, as advertised on the Forum. On these occasions help is given by fellow members rather than designated "instructors". During these evenings, there is also an important social element of Club membership with general chat via the TeamSpeak VOIP. One regular event suitable for beginners, is informally called "Don Johnson and Friends". Members fly from a different airfield every week, and all fly to Gloucestershire EGBJ. Members are helped to explore FSX via its "shared cockpit" feature, and other help is provided as needed. Informal ATC dialogue is provided by members at take off, and an official VATSIM controller (also a Club Member) on arrival at Gloucestershire. These factors all are aimed at improving beginners' confidence. When members sign up for one to one training with an instructor, the details are added to the Club Training Calendar. If members have signed up for such training, they can always check here for the dates and times of their training slots, and the name of their instructor. Each Instructor's entries are added in their own distinctive colour, so students can quickly recognise their own instructor. It is rare for students to have more than one instructor. Click on the picture to download the two Club Training Aircraft. Normally, the Club uses a specially modified Cessna 172 for training. Although essentially it is the default Cessna 172, it is painted in Club colours and has a simpler instrument panel. We have G-CIXN normally based at Gloucestershire, and G-CIXD normally based at Biggin Hill. These locations can be changed to suit student's needs. Our flight instructors will assist in setting up the aircraft for training, if needed. Help is always available, either simple text-based guidance via our very active Forum, (an average of over 30 posts per day) or on voice via our TeamSpeak server. You can use the Forum to arrange to meet members on TeamSpeak at an arranged time to discuss problems. Experienced members are almost certain to have come across most of the online flying problems which can arise with what is, in the end, quite a sophisticated and complex internet system. They are always willing to share that experience with new members. Note: The Club does not provide any training material for flying aircraft outside the ICAO defined "light aircraft" category.